The Christmas tradition of gift-giving is tied by many to the Wise Men who gave Jesus Frankincense, Gold, and Myrrh. Frankincense was a perfume used in Jewish rituals of worship. Gold was the symbol of Kings, and myrrh was a perfume used on dead bodies. The historical Saint Nikolaos of Myra was a fourth century Greek Bishop of Lycia. He is said to have given secret gifts of coins to those who left their shoes outside, a practice celebrated on his feast day, St. Nicholas Day on December 6 in the West and December 19 in the East. He is the model for Santa Claus. The patron saint of sailors, merchants, archers, repentant thieves, children, brewers, pawnbrokers, and students, he is revered by Anglicans, Catholics, Lutherans, Orthodox, and by some Baptist, Methodist, Presbyterian, and Reformed churches. Saint Nicholas comes in Europe on December 6. Children put their boots outside the door, polished and presentable, in hopes that St. Nick will fill them with candy, not switches. In some parts of Germany children are “kidnapped” in a jute sack and given a pretend “spanking” for their bad behavior or poor school performance during the year. On Christmas Eve, French children leave their boots in front of the fireplace, to be filled with gifts of candy, nuts, and small toys hung in the tree by Pere Noel. Romanian kids find small gifts under their pillows, candy, chocolate, oranges, flannel pajamas, or a small toy brought by Mos Craciun (Old Man Christmas) or Mos Gerila (Old Man Frost), the communists’ version. The Italian La Befana tradition dates back to 13th century. A benevolent old woman with magical powers, she travels on her magical broom to bring gifts on January 5, on Epiphany Eve. 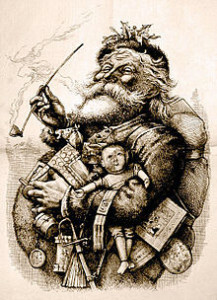 The custom of Babbo Natale (Santa Claus) has not been around that long in Italy, only since WWII. La Befana travels throughout Italy in search of Baby Jesus, bringing gifts to children. The three Wise Men had asked her to go with them to find Baby Jesus but Befana refused at first. She changed her mind and tried to find the Three Wise Men in search of Jesus but was not successful. La Befana goes down chimneys all over Italy to bring “caramele” (candy) or fruit to good children and “carbone” (coal), onions, and garlic to naughty children. Children leave their stockings and shoes out in hopes to find candy on January 6. To appease La Befana, children leave out notes, food, wine, sausages, and even broccoli. Russian children receive their gifts under the New Year’s tree from Father Frost (Ded Moroz) accompanied by Snow Maiden (Snegurochka). Father Frost carries a staff, wears valenki (felt boots) and travels in a troika (sleigh pulled by three horses). Christmas is celebrated on January 7 because the Russian Orthodox Church lives by the old Julian calendar which is 13 days behind the Gregorian calendar. Hanukkah or the “Festival of Lights” is celebrated by Jewish people for eight days in remembrance of their military victory and the miracle of the oil supply for the Temple. Family and friends eat holiday treats, give gifts to children, and play the dreidel game. This year Christmas and Hanukkah overlap for the fourth time in 100 years. We give gifts for many other reasons at Christmas time. We are obligated by family customs, job duties, commercialism, consumerism, and societal expectations to overwhelm children with the latest toys, gadgets, and games. A few more traditional parents give books, food, and candy. Compensation for a job well done is an opportunity for gift-giving, thanking a person for their hard work, for the long hours, dedication and exceptional effort all year long. Some gifts are for bravery in the line of duty or selfless sacrifice in saving another human being. Exhibition is my least favorite reason to give a gift. It is a well-to do person asserting their wealth by giving away vast amounts of money publicly. Some prefer to remain anonymous but most choose the venue of all-out publicity for their generous gifts. Compassion is the anonymous way of giving to a person you don’t know and cannot ever thank you for their gift, a person in need who has prayed for a miracle to save them from the abject poverty or the difficult situation in their lives. Gift-giving is always more rewarding in such a charitable circumstance. Appreciation for someone you know or love who has overcome a professional hurdle after years of difficult effort is a wonderful opportunity for a gift. Reminding someone in your life that they matter and you care about them. Duty is giving thoughtless gifts to family members, a boss, or colleagues, usually re-gifting unwanted items received in previous years from relatives and colleagues who also felt a sense of duty to send a present to someone they did not care that much about nor did they put much thought into their generosity. Love is the gift of togetherness, a symbol of the union of two souls who have found each other after years of searching. It is also the gift to beloved family members. Tradition is the gift on December 6 when children in Europe put out their boots to receive switches or candy from Saint Nicholas. The guilt of something from the past, the fundamental belief that wealth and good fortune should be shared at Christmas time is gift-giving driven by the need to share. Giving a gift in the expectation of receiving one in return, a favor for your gift, a quid pro quo of sorts, is buying benevolence and acceptance into a group. And then there are those Christians who would like to celebrate Christmas but are too poor and oppressed by their totalitarian governments who forbid them faith-based public displays and celebrations. They are just happy to be alive, to enjoy a good meal with their families, to have food, electricity and heat, and to be able to go to church on Christmas Eve. Those are priceless gifts. This entry was posted in Uncategorized and tagged Bishop of Myra, Christmas, gifts, Hanukkah, Saint Nicholas, Santa Claus, traditions by Admin. Bookmark the permalink. Ati scris foarte frumos despre Why Do We Give Christmas Gifts?